How to Break Windows 7 Password with ease? To avoid possible unfortunate incident that the users forgot their Windows login password, there are a lot of solutions to break Windows 7 password if you suddently forgot Windows 7 password in the market. Here I would like to share two with you. Windows 7 has its own a backup method called a password reset disk. How to create Windows 7 password reset disk? Step 1: Click “Start”->”Control Panel”->”User Accounts and Family Safety”->”User account”. Important: Insert a blank floppy disk or a flash drive into floppy disk drive. 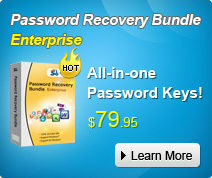 You are not able to create a Windows 7 password reset disk on CD, DVD, or external hard drive. Step 2: In the task pane on the left, click “Create a password reset disk”. Step 4: Choose the portable media drive to create a Windows 7 password reset disk on. Step 5: Continue to click “Next” when the following boxes appear. When the progress indicator shows 100%, click “Next” and then click “Finish”. You can now remove the floppy disk or the flash drive from your computer. How to use a password reset disk? Step 1: When you type the wrong password at the login screen. You will get the indicator like “The user name or password is correct”. Click “OK” to see “Reset password” option under the password box. Step 2: Insert your password reset disk, and then click on “Reset password” to open “Password Reset Wizard”. Step 3: Click “Next” and select the password reset disk. Step 4: Click “Next”, and an interface for you to create new password appears. You should type twice to make sure you type correctly. It is recommended to create a password hint to jog your memory if you forgot the password again. It is very efficient to use the first method. However, it is before you forgot the password that you have to burn it by yourself. Whereas, like most users, you don’t feel you need to trouble with, confident in the reliability of your memory. But when the day comes that supposedly familiar word slips your mind, you’re going to regret not making that preparation. Don’t fret, I highly recommend one third party program named Windows 7 Password Breaker which can reset Windows 7 password after you forgot the password. Step 1: Insert a blank CD in another computer that can run as administrator, and download & install & launch Windows 7 Password Recovery. Step 4: Boot your computer that can’t access to Windows with CD. You will see Windows Password Breaker under Win PE environment. Step 5: Choose the Windows installation to be processed. Highlight the account you want to reset password for. Click “Reset” and follow the wizard to remove Windows password. As long as you control these two methods above, I am sure you can break Windows 7 passwor without any effort.